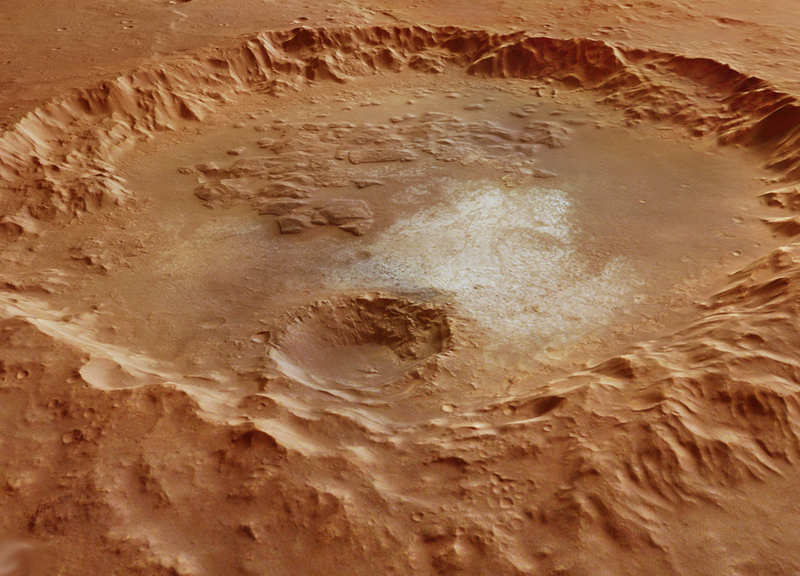 The scene, captured by ESA's Mars Express, is a composite of two images taken in March 2007 and February 2017. It focuses on a large crater in the Margaritifer Terra region in the southern hemisphere of Mars, and includes a portion of Erythraeum Chaos to the north (right in the main colour image below). Remnants of valley networks across the scene indicate that water once flowed through this region, shaping the features seen today. Indeed, as shown by the context image, Parana Valles lies to the east, while Loire Valles lies to the northwest. There are a number of distinctive features inside the 70 km crater, such as the striking light-toned material that is interpreted as exposed bedrock. 'Chaotic terrain' is visible both inside and outside the crater, marked by randomly oriented blocks separated by troughs. In general, chaotic terrain is associated with the collapse of the surface above regions where large amounts of subsurface water have been released, for example by the sudden melting of ice. As such, outflow channels often begin in chaos terrains. Chaotic terrain may also mark the sites of ancient lakes, such as in Erythraeum Chaos to the north (right) of the crater in this scene, between Loire and Parana Valles.